A much better edit of Victy's Sandy portrait. 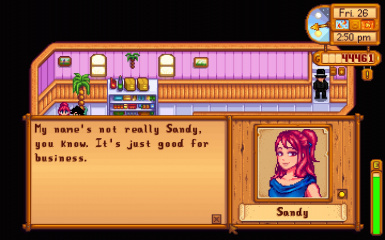 Credit to Victy for the original image and ConcernedApe for the base ponytail. Back in 2016, Androxilogin uploaded an edit of Victy's Sandy portraits. I really liked the concept, but the portraits were really blurry, the ponytail was inconsistently positioned, and its color did not match the rest of Sandy's hair. So, using the magic of Photoshop, I redid them so everything matches up and looks nice. Yay! Victy's original portraits can be found here. Androxilogin's original edits can be found here. 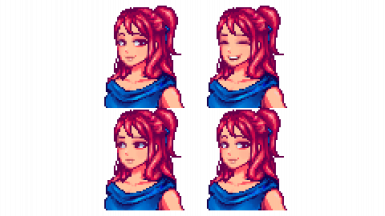 Go to the Portraits folder within your Stardew Valley folder (default Windows location is C:\Program Files (x86)\Steam\steamapps\common\Stardew Valley\Content\Portraits) and replace the Sandy.xnb file with this one. I'd recommend backing up the original file in case something goes wrong. Note that sometimes, if the game updates, your portraits can be reverted to normal. If that happens, you'll just have to reinstall them.